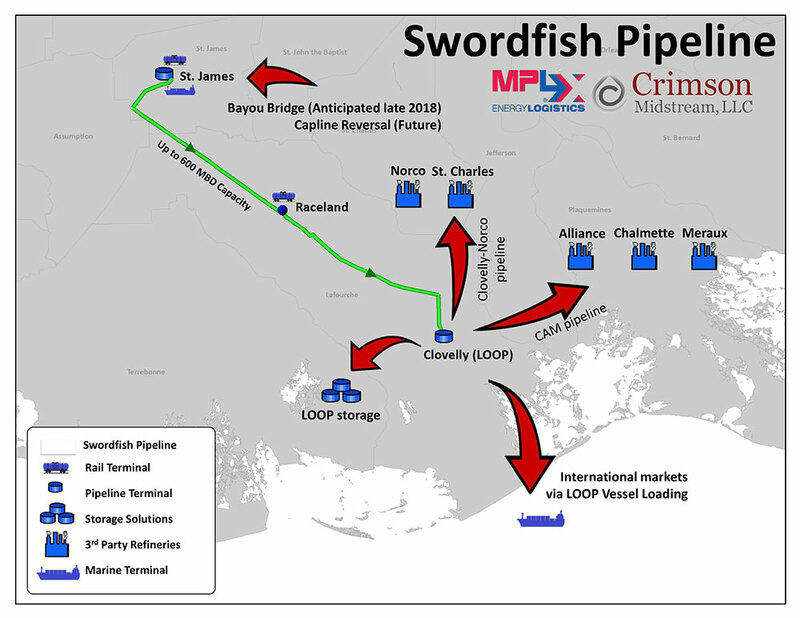 LONG BEACH, California, Nov. 29, 2018 – Since the Swordfish Pipeline binding open season was announced on Oct. 17 by Crimson Midstream, LLC and MPLX LP (NYSE: MPLX), the Louisiana Offshore Oil Port LLC (LOOP) terminal facility in Clovelly, Louisiana reports that customer requests concerning its deepwater port export capabilities have risen sharply. In addition, LOOP has stated that the number of vessels loaded can be scaled to meet increasing market demand. To allow prospective shippers sufficient time to evaluate this new information and to account for the holiday season, Crimson and MPLX today announced an extension to a binding open season to continue to assess interest and solicit commitments from prospective shippers for transportation service on the Swordfish Pipeline.